If you are not already a member of Facebook, here is your reason to sign-up. A community of people have created an IdeaFestival Group. Why become a member of the IF group? - While ideaFestival main site is the main source for news, information, event passes, speaker information and the agenda - and IFblog gives you something to think about everyday - the IF group on Facebook hopes to become an interactive community of speakers, attendees, etc. from around the globe. Through the use of the discussion rooms, videos, picture uploads and other great Facebook tools, the community will help keep open the lines of communication between everyone and anyone connected with the ideaFestival. Our group is linked on the left side of the blog. Come see us. If You're So Smart, You Fix It! 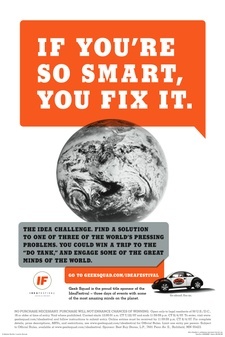 The Geeks at Geek Squad are working with IdeaFestival to help find people whose ideas could help save the planet! So, if you ever had an idea that you thought could change the world - the Geeks are looking for your help. This interactive website will allow you to scribble, insert drawings etc. to help explain why a panel of IF speakers and others should choose your idea. If your idea is selected, you will be brought to IF 2007 in Louisville KY, this Sept 13-15 to have your idea worked on. And if you need some help - don't worry, various IF speakers and attendees will be there to help you! To learn more and submit your great ideas, go to www.geeksquad.com/ideafestival. May the best geeks win! Every week, a few people at our agency meet over lunch to talk about a book of interest. I guess you could call it a book club with a twist - someone new gets to make lunch for the group. I call it a Read & Feed. Our book this past week was Seth Godin's "Purple Cow," which is an insightful and enjoyable discussion about the evolution of marketing. To paraphrase, "a Purple Cow is something - anything - that is truly remarkable." If you haven't read the book, I recommend it, no matter what your line of work. While reading, we starting discussing what "Purple Cows" existed in our personal lives. Is it the car we drive? Is the name tag on the clothes we wear? The answer was yes. But the biggest revelation to the group was that the brands and companies that appealed to us are driven by people or groups of people who have a deep passion for what they do. They're after more than just a business or a way to make money. They believe what they are doing is worth almost any effort. It is a way of living. Polly LaBarre does a great job of showcasing these people in her book “Mavericks at Work,” which is another must read. For those that want a quick insight into what I am talking about, download the first podcast of the 2006 festival. It is her session on these extraordinary, passionate people. If you have spent even 5 minutes with Kris Kimel, you will probably know what I am talking about. This gathering is a result of his desire and passion to create a community of people and ideas that enrich each other. I'm excited about what this sharing and growing of ideas and innovation will become. Right now, maybe the IdeaFestival is better described as a Purple Calf - sorry, Seth, for liberty with your language. Whatever people decide to call it, I find myself anxious and restless in anticipation of how remarkable this Festival can become. See you September 13-15 in Louisville. Seth, I hope you are coming too! I just wanted to let IF readers know that a new contributor, Brett Jeffreys, will post from time to time at IFblog. Brett heads up business development at a Louisville, Kentucky ad agency, Paul Schultz, which has worked with the ideaFestival, designing among other things the nifty orange IF logo at the top of this web log. Brett plans to talk a little bit about life in the business of creativity. He is also one of the nicest people I've met, which makes perfect sense once you find out he's from Toronto. Being an all around good guy must be a requirement for the Canadian passport.